Following the landmark SPRINT trial, there is a growing body of evidence for reducing systolic blood pressure targets, resulting in the development of new US guidelines. However, this has led to many questions about the impact of such fundamental changes in blood pressure management, and whether they should be implemented in other constituencies. Two new studies published in the Canadian Journal of Cardiology assess the benefits and costs of incorporating these more aggressive goals into clinical practice. The Systolic Blood Pressure Intervention Trial (SPRINT) published in 2015 was a randomised, controlled, open-label trial conducted at 102 clinical sites in the US. It compared an intensive systolic blood pressure target of 120mmHg to the current standard target of 140 mmHg in individuals at high cardiovascular risk and without diabetes. It was halted early after interim analyses showed patients in the intensive arm showed a significant decrease in fatal and nonfatal cardiovascular events and death from any cause. Based on these statistically-significant findings, as well as the growing global body of evidence showing a strong association between lower systolic blood pressure targets and a reduction in cardiovascular events, an intensive systolic treatment target of <120mmHg for selected high-risk patients was adopted into the Hypertension Canada clinical practice guidelines in 2016. In 2017, the American College of Cardiology (ACC) and American Heart Association (AHA) issued new guidelines for high blood pressure that redefined hypertension as a blood pressure equal or above 130/80mmHg, as well as lowered the blood pressure treatment goal for the general American population. However, there has been fierce discussion on both sides of the 49th parallel where to go from here. In the first of the new studies, Alexander Leung, MD, MPH, from the University of Calgary, Calgary, Alberta, Canada, explained that: "The generalizability of the SPRINT intensive blood pressure treatment strategy to the Canadian population remains unknown. Uptake of these recommendations into clinical practice is expected to have broad implications on healthcare policy, resource utilization, and clinical outcomes and may pose certain challenges such as more frequent clinic visits, increased drug costs, increased rates of adverse events, and other heightened healthcare expenditures." Dr Leung and colleagues report on a cross-sectional study, using population-based, nationally representative data, to estimate the prevalence and characteristics of blood pressure in Canadian adults between the ages of 20 and 79 meeting SPRINT eligibility criteria. They found that 1.3 million (5.2%) Canadian adults met the criteria. If fully implemented, lowering the systolic blood pressure target to <120 mmHg in SPRINT-eligible high-risk individuals would prevent 100,000 deaths annually, but would substantially increase the proportion of Canadian adults receiving initiation or intensification of treatment for high blood pressure. Over 180,000 people, who were not previously considered to have hypertension or need for antihypertensive therapy, would be included. In addition, around 750,000 older individuals (or one in five) above the age of 50 currently treated for high blood pressure would require more medication to reduce their blood pressure further. 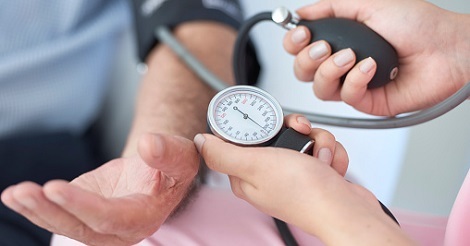 "Adopting intensive systolic blood pressure targets would result in a large number of individuals with treated hypertension being relabeled as inadequately controlled, as well as a significant proportion of the general population not previously considered to have elevated blood pressure being reclassified as requiring blood pressure lowering therapy," noted Dr Leung. "Such a change would have far-reaching implications on healthcare resource utilization, public policy, and healthcare delivery." In the second study, Remi Goupil, MD, MSc, from the Hôpital du Sacré-Coeur de Montréal, Montréal, Quebec, Canada, and colleagues examined the differences between the 2017 Hypertension Canada and 2017 American College of Cardiology and American Heart Association (ACC/AHA) blood pressure guidelines. "The 2017 ACC/AHA guidelines present a paradigm shift in the definition of high blood pressure while updating treatment initiation thresholds and blood pressure targets," said Dr Goupil. "This has led to many questions about the impact of such fundamental changes in blood pressure management, and whether it should be implemented in Canada." The investigators assessed the number of individuals with a diagnosis of hypertension, blood pressure above thresholds for treatment initiation, and blood pressure below targets using the CARTaGENE population-based cohort. CARTaGENE is a population-based cohort designed to study demographic, clinical, and genetic determinants of chronic diseases. Individuals from the province of Quebec were randomly selected, based on provincial health registries, to be broadly representative of the general population. In total, 20,004 individuals 40-69 years old were selected in four distinct urban areas. Analysis showed that adopting recommendations from the 2017 ACC/AHA guidelines in Canada would result in a substantial increase in diagnoses of hypertension and of individuals requiring drug treatment in Canadians aged between 40 and 69. It would also result in a change in blood pressure targets in a high proportion of hypertensive patients already receiving treatment. This would represent approximately 1.25 million more individuals with hypertension, and 500,000 more individuals requiring antihypertensive treatment. "Switching to these new guidelines would result in a higher prevalence of hypertensive individuals in Canada and an increase in the number of people that would need to be treated," remarked Dr Goupil. "Almost one in five individuals needing treatment would have a different blood pressure target from one guideline to the other. These changes would greatly impact the lives of millions of Canadians and result in a significant increase in the economic burden of this condition, with uncertain effects on cardiovascular complications." In an accompanying editorial, Ross Feldman, MD, Medical Director of the WRHA Cardiac Sciences Program, Winnipeg, Manitoba, Canada, points out that undertaking these more aggressive goals should be based on frank discussions with patients outlining both benefits and risk, and that management should be based on automatic office blood pressure (AOBP) readings, as used in the SPRINT trial, which may well correspond with higher ambulatory blood pressure (ABP) readings. Dr Feldman is past President of the Canadian Hypertension Society and Hypertension Canada and has been involved in the Canadian hypertension guidelines since 1991. "Regardless of the guidelines we use, in the post-SPRINT era, there are more patients than ever who can expect clear benefit from applying lower targets for their blood pressure control--but with increased risk of adverse effects. These studies remind us that on a public health basis, getting the guidelines right does matter. For every adjustment in blood pressure targets, there are benefits and there are costs--both for patients and in our publicly-funded healthcare system, for all Canadians," remarked Dr Feldman. However, Dr. Feldman also points out that more important than any of the fine details of a guidelines process is the effectiveness in their dissemination and implementation. "It is better to have suboptimal guidelines that are followed than it is to have 'perfectly' crafted and up-to-date guidelines that are ignored."